Not so many meals ago, the mere mention of kale was enough to make me dig in for a second helping of homemade mac and skip the green veg altogether. Calling it a superfood struck me as overselling. Why the superlative if it’s so great on its own merits? It’s not like I’d never tried it. I tried making kale chips next. And they’re fine, but not particularly worth the time and effort IMHO. But a comes together quick side dish with bacon and onions? Now I’m interested. Thank you, good people of MyRecipes.com (original recipe here). More, please. Sauté bacon in skillet; remove from heat. Add olive oil and sauté onions until cooked through (or blacken them, the way I do almost all my onions!) Add all remaining ingredients and cook until broth is almost fully reduced. 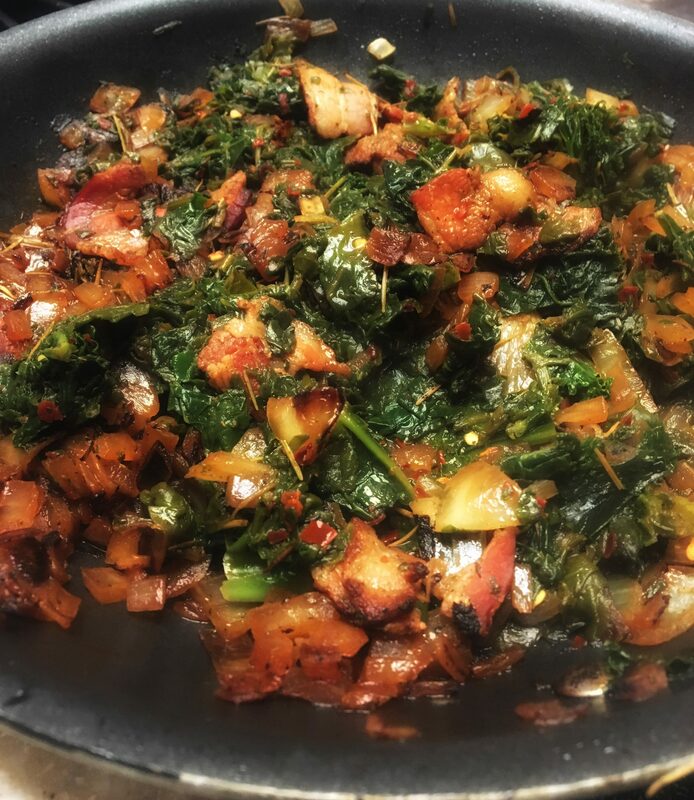 MFP entry: Kale with Bacon and Onion, 1 cup, 113 cals. Next Next post: I donated for the first time today, and this happened.